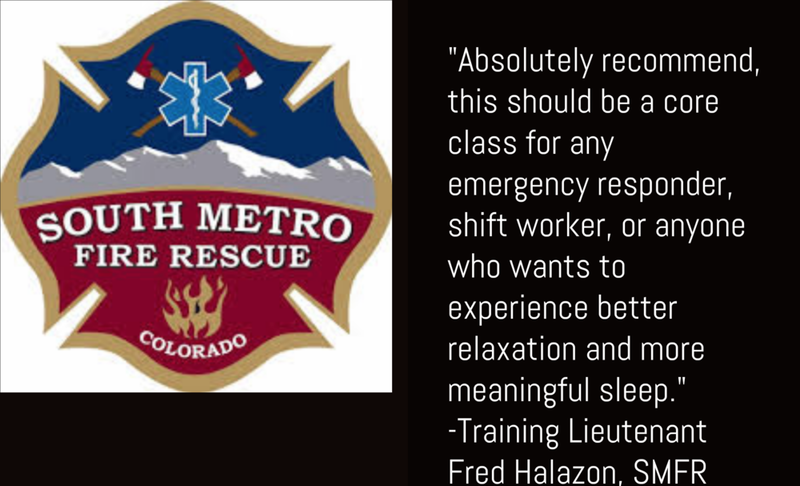 AXS WELLNESS LLC IS PROUD TO BE PROVIDING THE FIRST RESPONDER SLEEP RECOVERY PROGRAM IN PARTNERSHIP WITH THE BRIGHTON FIRE DEPARTMENT TO BENEFIT THE HEALTH AND WELLNESS OF ITS' MEMBERS. Instructing this training will be AXS Wellness Founder & Sleep Specialist, Jacqueline Toomey and her firefighter husband, Sean Toomey. Come prepared to learn in this class how sleep patterns relate to firefighter health, how sleep loss is directly linked to cardiovascular issues, cancer, and more. More importantly, be ready to learn solutions to mitigate the effects of sleep deprivation and begin to sleep better today. We will discuss nutrition, routine, environment and more. The capstone of our program is a clinically proven sleep technique, a method of deep relaxation endorsed by the DOD and US Surgeon General. The last hour of the class will be experiential and you’ll leave feeling rested and reenergized.